SAN CLEMENTE, Calif., Sept. 2, 2014 – There's an old saying, "good things come to those who wait." For this year's Northwest Oakley Surf Shop Challenge presented by SURFER Magazine, this adage proved spot on. Faced with a flat ocean for the scheduled date of July 23rd, contest organizers chose to postpone the competition to August 27th. This executive decision ended up paying off for Pacific Wave who claimed the win and the all-expense-paid trip to Central America to defend their status at the 2014 National Championships. Five teams, comprised of four surfers each, from surf shops spanning from Carmel to Pacifica, were greeted by an oily ocean with consistent and rippable, shoulder-to-head-high South Swell pouring in like clockwork all day. The bombing surf, coupled with balmy, bronze-worthy summer sun, set the scene for an epic day of high performance surfing. The Oakley Surf Shop Challenge series takes an alternative spin on competitive surfing. Invited surf shops are able to choose four surfers per team, consisting of two professional surf shop riders and two surf shop employees. These teams must work together in a rotational tag-team surf-off, sending out one rider at a time, among them one predetermined "whammy" surfer, who has the option of raising their hands at the end of their ride, doubling the total of that wave's score. This format makes it imperative that teams choose their whammy surfer wisely, adding yet another layer of strategy to this unique event. Due to a lack of surf shops entering the Northwest fray this year, organizers had to tweak the format slightly. With only five teams competing, Pacific Wave, Billabong, O'Neill Surf Shop, Nor Cal Surf Shop, and On the Beach, the call was made to hold one preliminary, 80-minute heat with all five shops in the water, and the top three advancing to the Final. 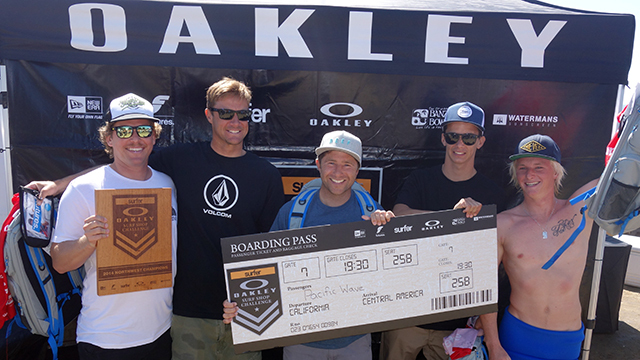 This qualifying heat was highly contested, with all teams using tactics and talent to secure a spot into the Final, where the winning team would earn an all- expense-paid trip to Central America to compete against the other regional qualifiers in the Oakley Surf Shop Challenge Championships. When the buzzer sounded, two-time Northwest champions Pacific Wave came out of the gates swinging. Bud Freitas unleashed a barrage of power hacks to secure a 7.9, which was quickly backed up by teammate, and Pacific Wave "whammy" surfer Randy Bonds claiming a 7.33. Towards the business end of the heat, things heated up, as Billabong Surf Shop's whammy surfer Homer Henard was left out the back with a half an hour left to secure (and whammy) a 7-point ride. Despite the solid bombs on offer, Henard came up just short with a 6.13, gifting Nor Cal Surf Shop a berth in the fFnals, along with Pacific Wave and O'Neill Surf Shop. Wasting little time in light of the perfect surf on offer, contest director Darren Brillhart opted to give the qualifying teams 15 minutes to prepare for the 60-minute Final. As in the previous heat, Pacific Wave seemed to do no wrong. Perennial power broker, and proud dad to a four-month old baby girl, Bud Freitas, opened Pacific Wave's account with a series of blistering man turns followed by an explosive tail blow on the inside section for a 9.33. Before the other teams could answer back, Randy "the Kid" Bonds, found a wide runner that allowed him to show off his patented backside attack, seamlessly flowing a series of vertical hacks, which he promptly whammied. The score came in at an 8.77, resulting in an adjusted score of 17.44, which was bolstered by solid scores by fellow teammates Willie Eagleton and Miles Clanton. O'Neill and Nor Cal Surf Shops fought back, but when the smoke settled, it was clear they couldn't match Pacific Wave's impressive score line, placing second and third, respectively. For only surfing two waves in the entire event, it could be said that Bud Freitas was the day's MVP. "That thing felt killer," remarked Freitas on his flawlessly surfed gem in the Final. "I was stoked, it went all the way across. Opened up with a big turn and a layback, linked it all the way through. I was waiting for the scores and thought it would be a seven or an eight, but they rolled the 9.33. I thought, "Oh I'm done, one wave I'm good!" he chuckled. Pacific Wave will join the rest of the regional qualifiers for the National Championships in Central America.